During the special event on March 29, the Faculty of Engineering and Applied Science honoured 125 alumni for their life and career achievements, highlighting the diverse ways that Queen’s engineers demonstrate leadership through contributions to society. Queen's celebrated the 125th anniversary of the Faculty of Engineering and Applied Science with a special event at the Four Points Sheraton. From left: Provost and Vice-Principal (Academic) Tom Harris; Chancellor Jim Leech; Vice-Principal (Advancement) Karen Bertrand; Principal and Vice-Chancellor Daniel Woolf; Vice-Principal (Research) Kimberly Woodhouse; and Dean Kevin Deluzio. Dean Kevin Deluzio speaks with Nancy (Moffat) Scarth (Sc'49), the first woman engineering graduate to complete all four years at Queen's. 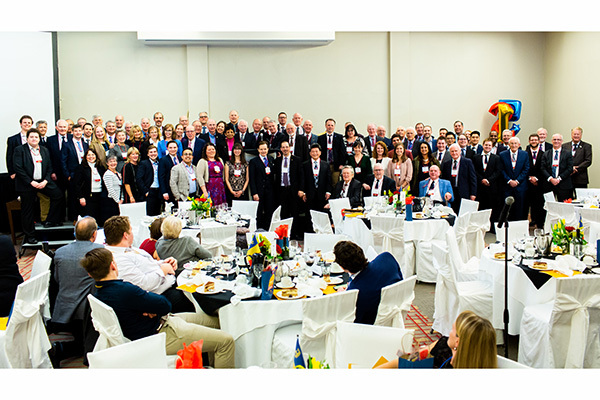 The Faculty of Engineering and Applied Science at Queen’s University celebrated 125 years of engineering excellence on Friday, March 29, with a special event honouring 125 alumni for their life and career achievements. The event, the first of its kind for engineering alumni, highlighted the diverse ways that Queen’s engineers demonstrate leadership through contributions to society. Award recipients included Mac Evans (Sc’64, LLD’14 Law), the former president of the Canadian Space Agency, and Mary Ann Turcke (Sc’88, MBA’97), the COO of the National Football League. Veena Rawat (PhD’73), the first Canadian woman PhD student in electrical engineering, was recognized, as was Erum Afsar (Sc’95), named a Top 40 under 40 by Avenue magazine for her work leading transformative transportation projects and supporting artisans in India and Pakistan. Jennifer Buechel (Sc’92, Artsci’97) was recognized for her work developing and launching novel drug therapies and the world’s first early detection blood test for cancer. Kevin Doucette (Sc’02) has combined his background in engineering and music composition to create an artificially intelligent musician, work that has attracted the computer science division at MIT. The Faculty of Engineering and Applied Science has grown and changed significantly from its beginnings at Queen’s as the School of Mining and Agriculture in 1893. One of the top engineering schools in the country, the faculty offers 10 dynamic engineering programs, and recently introduced Ingenuity Labs, a new interdisciplinary engineering research initiative focused on the design and use of intelligent systems and robotic machines. Last year, over 6,300 students applied for 730 first-year positions. The faculty also offers a number of outreach programs, such as the Aboriginal Access to Engineering program, which has engaged over 20,000 Indigenous youth, and the Tech ‘n Tinker trailer, a mobile makerspace that travels to schools and events in the region to provide experiential learning for elementary students. During the event, Dean Deluzio noted that many alumni have said how much their time at Queen’s has shaped who they’ve become, both personally and professionally.